The soil must be prepared before seeds are planted. 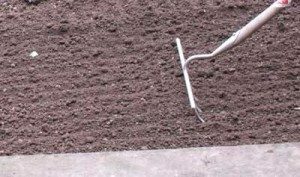 The prepared soil is called a seed bed. 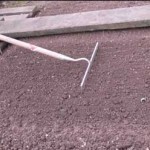 Use a rake to get an even depth of fine soil so that the seeds can be planted shallow. 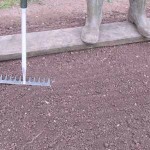 Stand on a board, placed over the adjacent ground, to protect the soil from being trampled down. Preparing a seedbed is a huge investment into the plant’s future.